TEMPE, AZ. 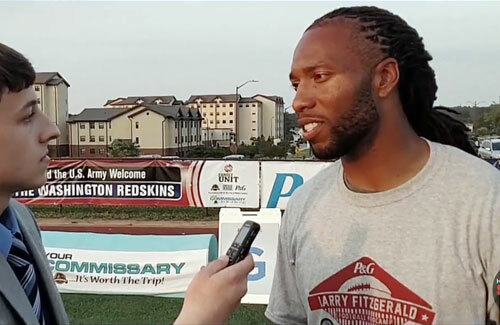 — Join Arizona All-Pro Wide Receiver Larry Fitzgerald at the Larry Fitzgerald Football ProCamp presented by SunnyD and Papa Johns. The camp takes place May 7 – May 8, 2015 at Bill Kajikawa Practice Fields at Arizona State University in Tempe for Boys & Girls, Grades 1 to 8. Source: Procamps. Larry Fitzgerald is considered one of the top wide receivers in the NFL. He plays for the Arizona Cardinals and is a 7-time Pro Bowl selection. He played collegiately at Pitt. He . He is also a popular motivational speaker. If you would like to book football speakers or professional athletes like Larry Fitzgerald for a speaking engagement, autograph signing, product endorsement, fundraiser or special event, contact a Larry Fitzgerald booking agent for appearance and speaker fees at Sports Speakers 360 or call 1.855.303.5450.